In 2005, Toyo Communication Equipment Company, Ltd. was integrated with the Quartz Device Department of Seiko Epson to become Epson Toyocom Corporation. Toyo Communication Equipment Company has a long history. Its predecessor was founded in 1891, after which the company began to develop its principal business of manufacturing telecommunications devices. So impressive was their technological prowess that the company's wireless radios were adopted for use in combat aircraft known as ‘Zero’ fighter planes in the Second World War. Although Toyo Communication Equipment Company started out as a manufacturer of telecommunications devices, it became better known as a quartz device manufacturer in the 1980s through to the 2000s. From telecommunications device manufacturer to quartz device manufacturer - the stimulus behind this transformation was the ‘industrialization of artificial quartz.’ In this edition of the QMEMS Story, we follow the efforts of the engineers who first succeeded in industrializing artificial quartz in Japan. It took almost 10 years after the end of the Second World War before some cheer returned to the faces of people in the streets. The so-called ‘Jimmu Economy’ began and the nation began to revel in booming prosperity. As a telecommunications device manufacturer, Toyo Communication Equipment Company, Ltd. was no exception, improving its business performance dramatically. The company's products sold quickly and were immensely popular. Although daily life became busy for the employees, they did not complain because they felt a sense of fulfillment. Wireless communications devices sold particularly well. Demand skyrocketed for devices such as short-wave radio telephones for electric power companies, portable radios for railroad use, and very high frequency (VHF) radios for ropeway use. In addition, a period of full-fledged market expansion began for cable communications devices, such as relays and switches, for Nippon Telegraph and Telephone Public Corporation (now known as ‘NTT’). All employees felt sure that they were on the verge of a very bright future indeed. However, in 1954, these hopes were swiftly crushed when a new problem began to manifest itself: quartz material was in short supply. Some readers may wonder why insufficient supplies of quartz would be such a serious problem. The fact is, quartz material is vital for wireless radios and cable communications devices to function. Crystal units manufactured using quartz material are capable of generating an extremely stable frequency signal. This signal was essential for these devices to communicate with each other, and without crystal units, they could not have functioned. In other words, crystal units acted as the ‘heart’ of telecommunications devices. This essential role remains unchanged even today. Actually, crystal units had been in danger of running into short supply long before this, since immediately following the Second World War, because of the need for natural quartz to manufacture them. Although Japan was able to mine a certain quantity of its own natural quartz, it was very difficult to find good quality large blocks with few impurities and no bicrystals (a union of two mutually symmetrical crystals rendering it unusable in quartz devices). In those days, Brazil was the only country in which large quartz blocks could be found with this degree of quality. 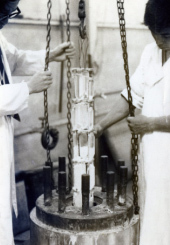 However, it wasn't long before it became difficult to acquire large, good quality quartz blocks even in Brazil, because quartz material was extremely important for munitions. According to Mr. Kunihiko Nagai, currently a lecturer at the School of Bioscience and Biotechnology at Tokyo University of Technology, and who was once involved in the development of artificial quartz at the Toyo Communication Equipment Company, "almost all mines that could produce good quality, large blocks of natural quartz were controlled by the U.S. Army. Nevertheless, we traveled from Japan to Brazil, and were somehow able to secure the natural quartz we required." This kind of crisis measure may have been enough to tide the company over in any other period of comparatively low demand. However, demand was continuing to surge onwards and upwards, spurred by a historically booming economy. The ‘Band-Aid approach’ was no longer working. Without quartz material, the company would not be able to continue manufacturing its wireless radios. The problem of insufficient quartz materials was really a matter of life and death to the Toyo Communication Equipment Company. Meetings continued late into the night, every night, at the company's Kawasaki plant, in an effort to somehow overcome this urgent problem. As the number of meetings grew, the opinions of all involved gradually began to converge into a single direction. Namely, that if they couldn't secure a supply of large, natural quartz blocks, they would have to create their own artificial quartz. Naturally, they encountered some resistance as doubts were expressed as to whether they could truly manufacture high-quality quartz in large enough pieces. Still, they hadn't found any alternative solution demonstrating better potential than this. They knew that in principle, they should be able to manufacture artificial quartz, and that if only they could achieve this, the critical issue at hand would be resolved. With the decision made, they began to apply themselves to researching the manufacture of artificial quartz. This is an example of artificial quartz currently being manufactured by Seiko Epson. The company is now capable of producing large blocks of artificial quartz that is completely transparent. However, when development initially began, they were only able to create extremely small fragments that were colored, not clear. Just as they were pondering the next step, a newspaper article, titled ‘Yamanashi University succeeds in synthesizing artificial quartz,’ was published. It was truly a case of perfect timing. Toyo Communication Equipment Company immediately dispatched two of its staff, Mr. Koga and Mr. Fukunaga, to Kofu City in Yamanashi Prefecture, where the University is situated. There, they met with Professor Minoru Kunitomi and his assistants, Sadao Taki and Junpei Asahara. To the north of Kofu City in Yamanashi lies Shosenkyo, an area known for its abundance of natural quartz. It is no surprise, then, that there are many companies located in Yamanashi that are involved in gem polishing and jewelry manufacture. Professor Kunitomi and his colleagues had begun their research into manufacturing artificial quartz in 1953, in an effort to support local industry development. The following year, in 1954, they had succeeded in producing Japan's first artificial quartz, using a small autoclave (a high-temperature, high-pressure kiln for growing artificial quartz) installed on the roof of the university (Figure 2). Mr. Koga and Mr. Fukunaga were able to witness first-hand the research results they had read about in the newspaper article. The two Toyo Communication Equipment employees were warmly welcomed by Professor Kunitomi. He gave them a detailed explanation of the process of manufacturing artificial quartz and then showed them the experimental autoclave. It was extremely small compared to modern-day autoclaves, with a gauge of 35mm and depth of 500mm. However, it was the first time either of the two colleagues had ever laid eyes on such a device. Mr. Koga revealed that he was deeply impressed at that time*1). "Toyocom Monogatari" by Toyo Communication Equipment Company, Ltd., pp. 60-66, published March 15, 1990. Mr. Koga and Mr. Fukunaga returned to Kawasaki, where they held a meeting with company president Saijiro Minato and staff in charge of technology to report on everything they had seen and learned at Yamanashi University. There was no objection from any of the participants at that meeting: they promptly decided to collaborate jointly with Yamanashi University, and started their research activities at the beginning of 1955. 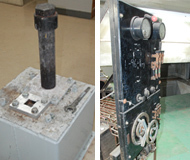 The left-hand photo shows the oldest autoclave still in existence at Yamanashi University. It is not known when this autoclave was built. With a gauge of approximately 30mm and depth of 510mm, this autoclave continues to be used to produce artificial quartz at open lectures and the like. The right-hand photo was taken in the basement of Yamanashi University's Institute of Crystal Science and Technology (formerly the Institute of Inorganic Synthesis). In the past, a large, experimental autoclave had been installed here. They began by working to make a new autoclave. The laboratory autoclave at Yamanashi University was too small to industrialize artificial quartz. An autoclave that was too small would result in artificial quartz that was also too small. The cost per unit would also be extremely expensive, since only a handful of crystal units could be manufactured from one piece of artificial quartz. A much larger autoclave was required to properly reduce costs and achieve industrialization. With the expertise of Yamanashi University's Professor Kunitomi, the team from Toyo Communication Equipment Company began working to develop a larger autoclave. The first model they produced had a 50mm gauge with depth of 800mm. This was followed by a slightly larger version with 70-80mm gauge and depth of 1500-1600mm. Finally, in 1957, they succeeded in creating a much larger autoclave with a 120mm gauge and 2000mm depth. However, their new, larger autoclave did not automatically guarantee they would be able to easily manufacture large pieces of artificial quartz. It was proving a difficult task to manufacture artificial quartz with minimal impurities that was also free of crystal defects. Fine-tuning, such as optimizing conditions for growing the artificial quartz and customizing the autoclave configuration, was an indispensable process (Figure 3). Another matter troubling the engineers was the unstable electrical power situation. Unlike our modern-day electricity, power supply in those days could be unstable with comparatively greater voltage fluctuations. As a result, mechanical temperature regulators would frequently malfunction or break. Even a drop of just 1 degree Celsius in the internal temperature of the autoclave could result in disconnected areas within the artificial quartz, thus drastically reducing the quality of the crystallization. In those days, it took one to two months to grow the artificial quartz after ‘planting’ the quartz seed, even to produce small pieces. Therefore, a drop in temperature in a very short space of time could instantaneously destroy months of hard work. It became clear that the autoclave required constant monitoring. As Mr. Nagai recalls, "When we were growing the artificial quartz, we often had to monitor it throughout the night, taking quick naps in our sleeping bags. When we couldn't monitor it ourselves, we would ask the security guards to watch it for us, and to contact us if something happened. That's why we often gave them gifts of Japanese sake in the O-bon holidays or at New Year, as a token of our appreciation." This photo illustrates a typical scene from autoclave development in the late 1950s to early 1960s. Here, the technicians are lifting out artificial quartz prototypes manufactured using their newly-created autoclave. After overcoming many hardships, they finally succeeded in manufacturing a relatively large piece of artificial quartz in 1959, signaling their readiness to begin industrializing the new material. The final hurdle would be to increase the number of autoclaves. With more autoclaves, they would be able to increase their volume production of artificial quartz, enabling them to manufacture many more crystal units. When they started at the beginning of 1959, they had just two 120mm-gauge autoclaves with a depth of 2000mm. However, in a stroke of good luck, they learned in June 1959, that ‘The industrialization of artificial quartz’ had been selected as the first commissioned industrialization theme of the Institute of Physical and Chemical Research (later known as the Research Development Corporation of Japan). This enabled them to secure the funding required for two more autoclaves, as well as procuring the necessary control devices. Additionally, Toyo Communication Equipment Company itself funded the manufacture of another five autoclaves, giving them nine autoclaves in total. They also installed a power supply device within the Kawasaki plant to stabilize the power (voltage), thus completing the fit-out with everything they would need to manufacture high-quality artificial quartz. Finally, they were in a position to be able to secure a sufficient supply of artificial quartz for manufacturing their crystal units. At last they were able to begin their long-awaited volume production. In other words, they had succeeded in industrializing artificial quartz in Japan for the first time (Figure 4). This story was published in newspapers everywhere. Rival companies also began work to develop their own artificial quartz. Although their company had started from scratch, Toyo Communication Equipment, together with Yamanashi University, had overcome many years of challenges and hardship to finally succeed in industrializing artificial quartz. They wanted to ensure they could continue to maintain their dominant position as much as possible. This would require that they produce a constant succession of new technologies. Toyo Communication Equipment Company decided to strengthen its technological development structure by creating a team of Japan's highest caliber of intellect. To achieve this, they recruited Sadao Taki from Yamanashi University (then an associate professor) and Junpei Asahara, who was then working at the Electrotechnical Laboratory, Agency of Industrial Science and Technology (now known as the National Institute of Advanced Industrial Science and Technology). This photo was taken in around 1996. Mr. Kunihiko Nagai is standing at the rear right side. Having succeeded at industrializing artificial quartz, their next struggle was to improve the crystallization quality and to make even larger autoclaves. When they first began with industrialization, they were particularly troubled by the crystallization quality of artificial quartz. According to Mr. Nagai, "Whenever we took our artificial quartz to the crystal unit manufacturing division, they always responded: "We can't use this!"" It was now virtually impossible to obtain natural quartz. The crystal unit manufacturing division therefore had little choice but to begrudgingly use the artificial quartz, and watch their yield rate fall. The reason they had difficulty using the artificial quartz was because of its inferior crystallization quality. Of course, if they found a crystal defect, it was still possible to simply remove it so as to deliver only the comparatively high quality portion. In appearance, artificial quartz closely resembled its natural counterpart. However, it lacked in ‘third order thermal properties (properties that make the relationship between temperature and frequency variation a cubic function),’ which is said to be the biggest characteristic of quartz. This prevented them from manufacturing high-performance crystal units. The cause was the extremely elaborate crystallization. 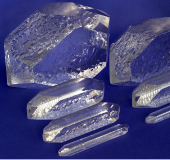 A close investigation of the manufactured artificial quartz revealed that the crystal lattice size differed to natural quartz. The artificial quartz had wider openings that harbored impurities. These microscopic differences could not be detected by external appearance alone, and resolving this new problem was going to be very difficult. They resolved this problem by modifying the solution used inside the autoclave. In the beginning, they were using sodium carbonate (soda ash), which was widely used by U.S. corporations. This solution enabled them to keep the temperature and pressure sufficiently low within the autoclave, as well as to accelerate the speed at which the artificial quartz grew. This, in turn, helped to keep costs low. However, it was not conducive to achieving the same crystallization quality as natural quartz. There was an alternative candidate thought to be suitable as a solution, however: sodium hydroxide (caustic soda). The trouble was that if they used this solution to manufacture artificial quartz, they would have to raise the temperature and pressure within the autoclave significantly. Furthermore, the quartz would grow at a much slower rate. Given its numerous disadvantages, they had been quick to dismiss sodium hydroxide as a material early on, due to its impractical nature. Still, it was clear from their experience thus far that they would be unable to obtain sufficient crystallization quality if they continued to use sodium carbonate. The team at Toyo Communication Device Company decided to take its chances. They embarked on volume production of artificial quartz using sodium hydroxide in parallel to the sodium carbonate-based quartz. At first, there was little difference in crystallization quality between the two types. 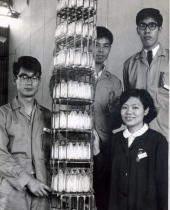 As Mr. Nagai recalls, "We continued to produce artificial quartz using both solutions until around 1965." However, the differences gradually became more apparent as they optimized their manufacturing methods, and by around 1970, they were clearly evident. By using sodium hydroxide and optimizing the conditions for growing the quartz, as well as customizing the configuration of the autoclave, they had finally succeeded in manufacturing artificial quartz with crystallization quality that was infinitely closer to natural quartz. "Junpei Asahara was spearheading the development of high quality artificial quartz at that time. The manufacturing floor was right next-door to where he was working, and he was constantly on the receiving end of some tough complaints. He often said that this was what actually helped him to achieve a great final result," recalls Mr. Nagai. Once they had lifted the crystallization quality, the volume sold to external parties also grew dramatically. The news that artificial quartz had been developed with the same crystallization quality as natural quartz rapidly reached European telecommunications device manufacturers, and Toyo Communication Equipment Company signed a succession of major contracts with many of these companies. Artificial quartz quickly grew into a major business. In conclusion, we should also mention how autoclaves were successfully made larger (Figure 5). By 1965, they had already developed ‘Model B,’ an autoclave with 300mm gauge and depth of 5000mm. Two of these were installed at the company's Sagami plant (in Samukawa-machi, Kanagawa Prefecture). At the time, Model B was boasted to be the world's largest autoclave, and it contributed greatly to dramatically reducing the costs of artificial quartz. ‘Model C’ was developed in 1973, with a 400mm gauge and depth of 8000mm. This one was installed at the Hobara plant (in Fukushima Prefecture, where the factory itself is now defunct). In 1984, the ‘Model E’ autoclave, with 650mm gauge and 14000mm depth, was installed at Miyazaki Toyo Communication Equipment Co., Ltd. The autoclave originally created for research purposes in 1959 had a 120mm gauge with a depth of 2000m. By the time this had morphed into the much larger ‘Model E’ in 1984, it had a 650mm gauge with 14000mm depth. Toyo Communication Equipment Company's positive approach towards creating ever-larger autoclaves helped it to become one of the few artificial quartz manufacturers in the world. Furthermore, its experiences with artificial quartz have acted as a driving force behind the company's development of numerous quartz devices. Toyo Communication Equipment Company has since launched a succession of quartz devices on the market. These are indispensable components for mobile phone handsets, GPS navigation units and laptop computers. In other words, the company made a major contribution towards the dawn of the information era. Joined Toyo Communication Equipment Company in 1965. Placed in charge of artificial quartz development, and thereafter was involved in the artificial quartz business from its initial stages of development, through the period of sales expansion, and ultimately, to the maturity stage. After reaching retirement age, he became involved in the development of new crystallization material at Toyocom Engineering, and later, became a lecturer at the School of Bioscience and Biotechnology at Tokyo University of Technology. He is currently researching blood sensors using biotechnology, while also working on next-generation personnel education. Joined Toyo Communication Equipment Company in 1972. Placed in charge of the development and design of crystal units. Thereafter, he was also involved in the development of Temperature Compensated Crystal Oscillators (TCXO), FM modulators and digital TCXOs. After being posted to the U.S. for a year and a half, he worked on the development and design of module components. Currently, he works at electronic device firm, Marubun Corporation. His hobbies include skiing, golf and listening to classical music. Joined Toyo Communication Equipment Company in 1977. Soon after, was placed in charge of developing and designing Monolithic Crystal Filters (MCFs). He later transferred to the Research and Development Division where he worked on developing Surface Acoustic Wave (SAW) filters. Currently, he belongs to the Device Management Division at Seiko Epson. His hobbies include skiing, running and fishing.